Police are appealing for witnesses following a collision in Colne which ‎left a 45-year-old man with serious injuries. The incident occurred at around 9-50pm on Friday at the junction of Windy Bank and Norfolk Street, when a grey Peugeot 207 collided with a Mini Countryman as the Mini turned right out of a supermarket car park. The Mini hit the pavement and collided with the pedestrian. 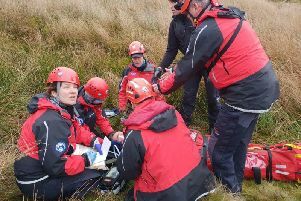 The pedestrian, from Colne, suffered suspected fractures ‎to his foot, which are described as serious but not life-changing. He was taken to Royal Preston Hospital, where he remains. Now police would like to speak to anyone who has information about the collision, or who witnessed ‎it and has not yet been spoken to by officers. Sgt Adam Dawson, of the Road Policing Unit, said: "This collision has left a man with some serious injuries and we would now like to piece together exactly what occurred. "We would urge anybody with information about the collision to contact us as soon as possible." Anybody with information is asked to contact police on 101, quoting log number 1433 of March 17th.